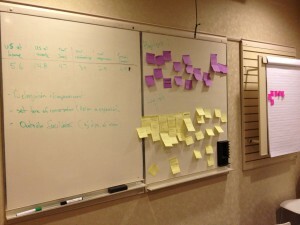 Last week our team reviewed our Happiness Index using the Delivering Happiness method. If you haven’t heard of it, check out their video. Since there is some personal stuff in our outcomes, I’m not going to go into those, instead I’ll focus on the experiment and how we used the method. There’s an online survey that takes about 15 – 20 minutes which asks you a bunch of questions to generate your ‘happiness landscape’. Some tips, you can create a team score provided all team members use the same email domain. You end up with an overall happiness index score, happiness landscape, highlights & lowlights and a dynamic model. It’s best to do the survey to gain an understanding of those scores. I asked everyone to printout their results and I also copied down the aggregate team score so people could compare their results with the team score. I wasn’t planning on asking everyone to share their numbers, unless of course they wanted to. After you fill out the survey you end up with a Happiness Landscape and a bunch of other data. I focused on the Happiness Landscape which gives you a 0 – 10 score across dimensions such as “you at work”, “you at home”, “your job” and more. For example, you could love your job but hate the environment you’re doing it in. write down on sticky notes your highlights (purple stickies) where your score was 9 and higher and your lowlights (yellow stickies) where your score was less than 2. Write down individual scores on a whiteboard under the team score and generate discussions from there. The team opted for #2 which seemed like a good choice based on the discussion that happened afterwards. Once we wrote out all the stickies, we clumped them together to look for patterns. Some of the highlight/lowlight labels are “motivation”, “creativity”, “work-life balance”, “job security” etc so it was easy to do this and patterns jumped out right away. Next we compared differences where some team members had highlights (score of 9 or 10) and others had the same result listed as a lowlight (score at or below 2). That helped generated discussions about that topic from different perspectives. We ended with generating 2 actions to help us improve our collective lowlights and assigned ownership to them. I had planned to do a sphere of influence diagram but it wasn’t necessary. 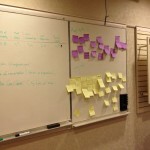 Sometimes I forget that working with a team of enlightened coaches makes facilitation easier! This is a powerful tool that generates deep discussions. I think having such an exercise in a low-trust team wouldn’t be as successful as it was for us. I also learned many of the same things make all of us happy. Most importantly it helped reenforce my stance that my responsibility is care for the well-being of my team members. That includes helping them develop their careers and doing what I can to help them enjoy work.